Free shipping on orders over €30! Latest designs from Shanti Boutique! Whether your business is big or small, Shanti Boutique would love to work with you. Ask us about free displays and educational info brochures. 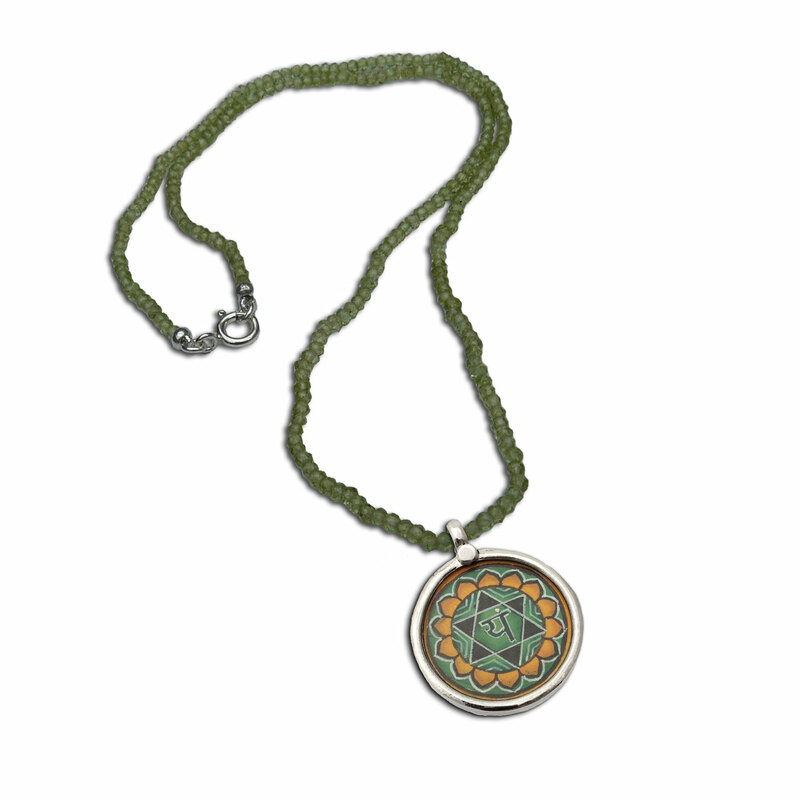 Shanti Boutique is a fair trade business with unique products. Ordering terms: 100% shanti guarantee, fast shipping, great products. We use many meaningful symbols in our jewellery. Sign up to receive monthly newsletters with special offers! Boost your heart chakra with this 18 inch faceted semiprecious gemstone Peridot necklace with a 1 inch miniature painting pendant with the symbol for the heart chakra. The painting may vary slightly from the picture as each one is hand painted. The painting is encased in sterling silver and glass. Chakras are energy crossroads, linking the physical body with the spiritual through an energy canal down the body. Each of the seven chakras has different properties and corresponds to a different mantra, color, stone and shape. 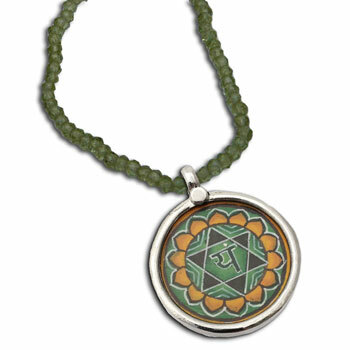 Heart Chakra (anahata): Universal Love. Compassion. Purity. Conscious * ethical * charitable ...with these qualities in mind and action, Shanti Boutique™ is a fair trade business committed to producing unique jewellery, positive for people and planet. We work directly with all of our manufacturers to ensure that workers are treated fairly and to ensure top quality of products. A portion of our profits is donated to the Tibetan Children's Education Foundation (TCEF), an organization dedicated to the preservation of Tibetan culture in exile. To donate to TCEF directly or sponsor a child please visit TCEF's website . Shanti Boutique™ is a proud member of the Fair Trade Federation. The Fair Trade Federation is an association of fair trade wholesalers, retailers, and producers whose members are committed to providing fair wages and good employment opportunities to economically disadvantaged artisans and farmers worldwide. We are also members of Green America Business Network. Green America is a nonprofit membership organization dedicated to harnessing the economic power of consumers, investors and businesses to promote social justice and environmental sustainability. European orders are shipped within 1-2 business days (if in stock) from our own warehouse located in the Netherlands. For delivery to destinations in the Netherlands, it take about 1 business day to arrive after shipping using PostNL. We ship by European Priority post to destinations within Europe. For delivery to destinations to other countries in Europe, it normally takes 3-5 business days once the order has been shipped, but can sometimes take up to a couple weeks depending on the speed of the post. If you are located outside of Europe, please visit our American/Global site. 100% Guarantee: if you are not satisfied for any reason (including buyers remorse) you may return any unused product within 30 days of receipt for exchange or 100% product refund. Please note: shipping is non-refundable. Please contact us before sending us a return. Direct Transfer to our bank account. Creditcard via Paypal (online orders only). Payment in full is required before shipping. Conscious * ethical * charitable ...with these qualities in mind and action, Shanti Boutique is a fair trade business committed to producing unique jewellery, positive for people and planet. We donate a portion of our profits to the Tibetan Children's Education Foundation. Proud members of Fair Trade Federation since 2005. Shanti Boutique is a certified green business by Green America.